Baseball strategy is based on facts, percentages and gut feelings, which can be acted upon or disregarded. However, when the facts overwhelmingly show that the majority of stolen bases are stolen off the pitcher, not the catcher, they can not be ignored. In the “Base stealing” segments you were taught how to spot pitchers’ indicators, which all pitchers have, which told you when it was safe to take off for the next base because the pitcher could not stop his motion home. Scientifically speaking, for baseball strategy, "For every action there is an equal and opposite reaction,” and you’re going to learn how to stop, or at least severely restrict, runners from attempting to steal bases off you, the pitcher. 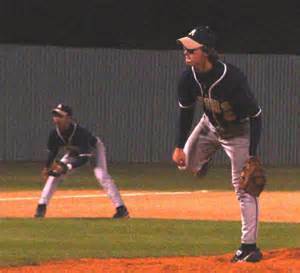 Pitchers, from an early age, are taught to develop a routine in-between pitches, which is timely and nearly identical every time, in order to maintain their control, mental sharpness and to maintain their fielders’ focus, as too much time in between pitches creates conditions where a player’s mind wonders and they shift weight from the balls of their feet, to their heels. The misconception, or mistake, some young pitchers make is they fail to realize once there are runners on base, they must divert from their routine and mix things up a bit in order to confuse the runner, or at least make him think more than he wants to, as thinking slows down reflexes. Methods: There are numerous methods utilized by MLB pitchers to prevent runners from attempting to steal and we’ll explore them now. 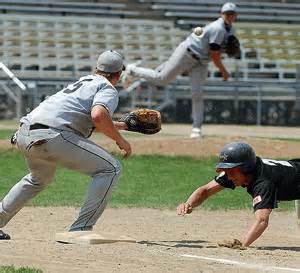 Number One: The easiest way to keep a runner somewhat confused as to when he should run, thus keeping him from straying too far off 1st base, is to vary your set time while in the stretch position. One indicator runners will key in on is timing the normal routine time the pitcher takes in between pitches, therefore, don’t have a Normal routine. When you come to your set position, hands together at your chest, intentionally vary the time in between throwing the next pitch. Hold your set position for 1 second the first pitch, 4 seconds the second pitch, 2 seconds the 3rd and so on. You need not consciously count the seconds, unless that’s the only method you can use effectively, but varying the time will prove extremely effective. The key issue to learn here is, you must not find yourself in a predicable pattern of when you throw the ball, either to the plate or for a pick off, as a good runner will pick this up and there’s no way the catcher will be able to throw him out with the jump he’ll get. Number Two: Another method is to throw over to first base again and again. 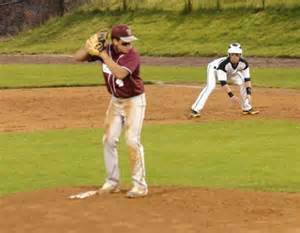 Number one, a pitcher will not show his best pick off move to the runner unless he’s making a for real pick off attempt. Number two, what the pitcher is actually attempting to accomplish is tiring the runner’s legs. The repetitive actions of taking a lead, holding the lead, then retreating back to the base takes a toll on the legs. The body quickly recovers from such minute lactic acid the muscles create by this tensing then relaxing, but it will negatively affect the “spring” in the legs short term, and that’s all you need. Speaking of showing pick off moves. As stated above, never show the runner your best move to 1st base unless you’re actually trying to throw him out. Show him the …. (A.) "I know you're there pick off move" which is performed in half speed or a little better. (B.) “Hey you’re getting too far off” pick off attempt, perform it at ¾ speed, as you want the runner to think that’s your best move and it’s as quick as you can get the ball to first base. Baseball Strategy - Best Move? (C.) Vary your physical body speed in conjunction with the speed you throw the ball over, creating an endless amount of variables, until he is convinced he has you figured out and he strays too far off the bag, which is when you snap the trap closed with your best move and a lighting quick throw over to first base. (1.) From your normal set position, as you begin your motion to throw to the plate, use your normal leg lift and delivery. (2.) From your normal set position, the next pitch, or the next, mix it up, do not lift your leg, but use a slide step toward the plate instead, which is actually the elimination of the leg lift and going straight to the plate from the set position. (3.) You’ll notice I stressed “Normal Set Position” in the first two examples, but you can easily alter your set position by varying where you stop your hands. Come set with your hands chest high, then at the belt buckle, then belly high, remembering that all you need to do, is be sure to pause your motion for at least 1 second. The rules say a discernable pause, which simply means everyone must recognize you stopped your motion before delivering home, otherwise it’s considered a balk. 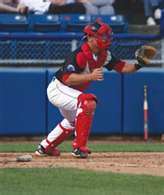 Number Four: Disrupting the runner’s timing is a great way to slow him down and give your catcher the advantage. 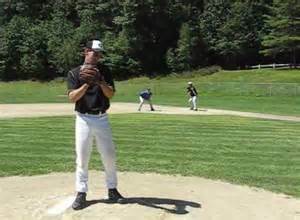 From the set position, simply step your back foot backwards off the pitching rubber and break your hands. You don’t have to do anything else if you don’t want to, but you can and it won't be a balk, and it will chase the runner back to the bag because you are legally able to do anything you want with the ball. This is an excellent method for a pitcher with a poor move to first base, because he’s not required to throw over, to keep the runner guessing and close to the base. Number Four: Special circumstances come to light occasionally which must be dealt with in different manners. One such circumstance is a runner on third base and you suspect the opposition is going to attempt a sacrifice bunt in order to score the run. Your goal is to keep the runner as close to third base as possible giving your infielders a chance to throw him out at the plate. Being a right handed pitcher there are essentially two ways to try and hold the runner closer to third. 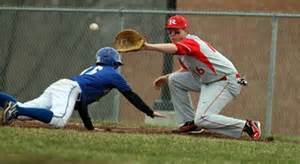 The best way to hold the runner close is to use the stretch delivery, implementing the same tactics as you would use with a runner on first base. The second method, which I don’t recommend, but I’ve seen it utilized, is to vary alternating the stretch and full windup. Be careful to not get so cute you fool yourself and become more involved with thinking about your windup than about the batter, as that produces mistakes and mistake pitches end up being deposited over the outfield fence. Number Five: There are other methods of obtaining the advantage over the base runners, which involve working with your catcher, as a battery. (1.) A pitch out is a good method to employ sparingly, and I say sparingly because it’s suppose to be a surprise and it’s not a good idea to pitch from behind with runners on base, but if the situation fits and you’re confident you can afford to waste a pitch … do it. (2.) 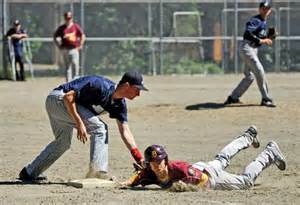 The Catcher throwing behind the runner is another excellent method of keeping base runners leery. If there’s a runner on first base who hasn’t indicated he’s trying to steal second base, but who is lazy about returning to first base after the pitch, a snap throw to first from the catcher can result in a pick off. This is where it’s important for the team to be well coached and aware of the ball at all times, because if the catcher throws to first and the first baseman is as surprised as the runner, you won’t get a put out, but the runner will most likely end up at second base, or third if the right fielder is also caught napping.